Connecting the modulars together allows you to construct the soakaway to the required size. 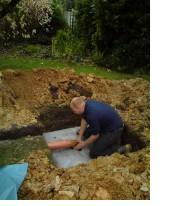 A percolation test is recomended to determine the size and depth of the required soakaway. Storm Crates For storm attenuation, infiltration or just as a soakaway Attenuation cells, (also known as Storm Cells, Soakaway Modules, and Storm Crates) are the modern equivalent of a soakaway. They allow surface water to be stored in one location and gradually released back to the ground, a bit at a time, at a pace the ground can handle, rather than in one sudden deluge, as happens during a storm or downpour. In effect, the transfer of water from the surface to the ground is attenuated, is slowed down and stretched out over a longer period. If you dump 1,000 litres of water onto a patch of ground in one go, unless you”re on sand or gravel, it”s unlikely the ground will be able to absorb all that water instantly: attenuation cells work by taking all the water as fast as it”s delivered, returning what it can to the ground as quickly as possible, but storing the surplus until the ground is ready and able to absorb it. 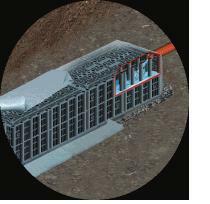 Attenuation cells are specially manufactured, modular cells that provide lots of space (void space, as it”s termed) within a cheap, lightweight structure that is capable of supporting quite significant loads when buried. Some cells can be placed beneath pavements and are strong enough to carry both foot and low-speed vehicular traffic. 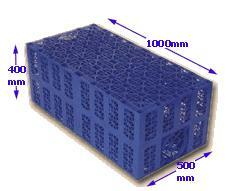 A pedestrian crate model 1000mm long, 500 mm deep and 400 mm high. Where mains sewerage is not available, the outflow from guttering systems can be directed into specialised soakaways. These differ from septic tank soakaways, as they are designed to disperse high flows of water – which can result from heavy showers – over short periods. Rainwater soakaways are usually large pits filled with open stone, although modern soakaways often use modular plastic “Aquacells”. A typical domestic house requires a rainwater soakaway of about one cubic meter. If the soakaways become blocked – for example, clogged with tree or shrub roots if they are located in a garden area – problems to guttering and downpipe systems can occur. We can also install rainwater harvesting systems, using tanks above or below the ground to store rainwater for other uses. Up to 50% of the water used by a domestic household could be substituted with rainwater – from watering the garden to flushing the toilet and supplying the washing machine.